With my first-born almost every day was a careful navigation around naps. Do I leave the house and end up with a cranky over tired baby or stay home locked in like a prisoner while my golden child sleeps soundly in his crib? I always felt like I was losing the nap battle. But the truth is, he’s four years old now, and none of those decisions really made a lasting impact. Some days he slept at home. Some days I moved him around from car to stroller to house. Some days I sat in the car for hours not wanting to disturb his slumber. But no matter what way he slept, he was just fine. With baby number 2, there has been CONSIDERABLY less thought into his when and where of naps. Honestly when his pediatrician asks me how his sleep is I laugh at the notion of a nap schedule. My answer is this – when he’s tired, he sleeps. Sometimes he sleeps for a long time in the crib. Sometimes he takes little cat naps from here to there. Either way they add up to enough. 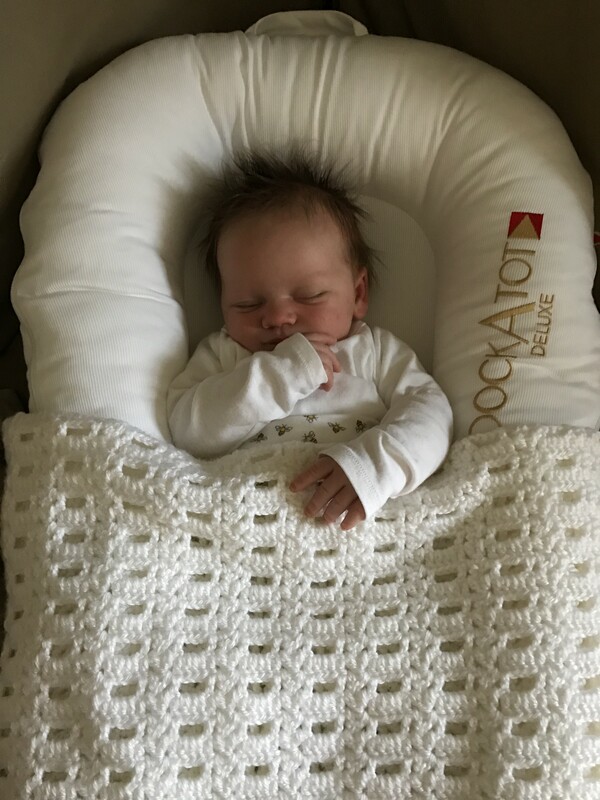 BUT, there is one thing that has made napping for number 2 way better for us – this beautiful little thing called the DockATot. 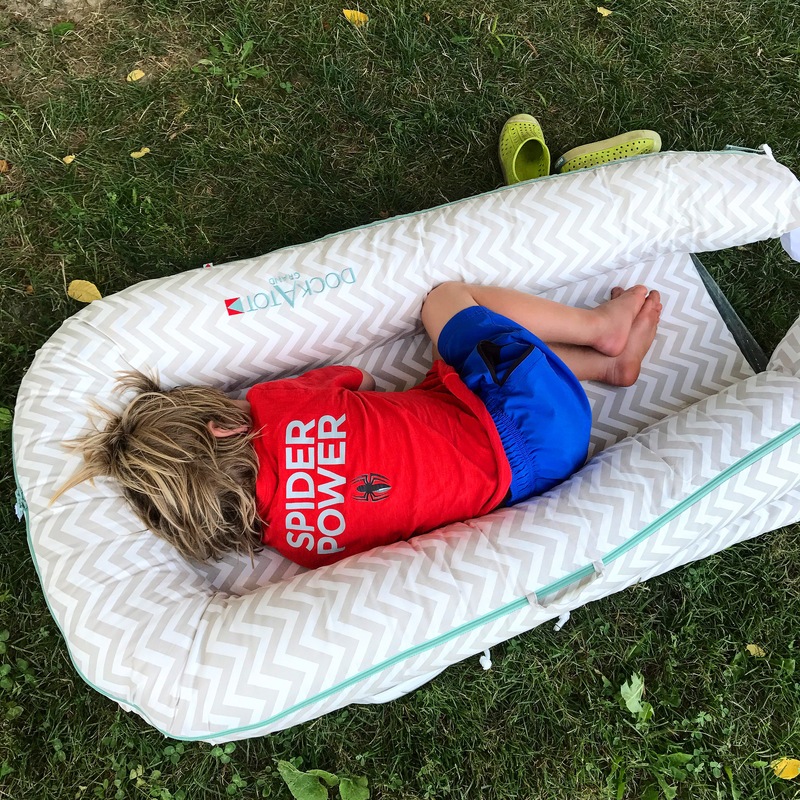 It’s basically a portable little bed that is magic for moms. When Luca was a baby we got the original size and he napped around the house in it. I could take him from room to room and know he had a safe place to sleep on the hardwoods. It was perfect for being able to keep an eye on him but also get him used to sleeping somewhere other than my chest or a moving object (swing, bouncer, car, stroller, etc.) 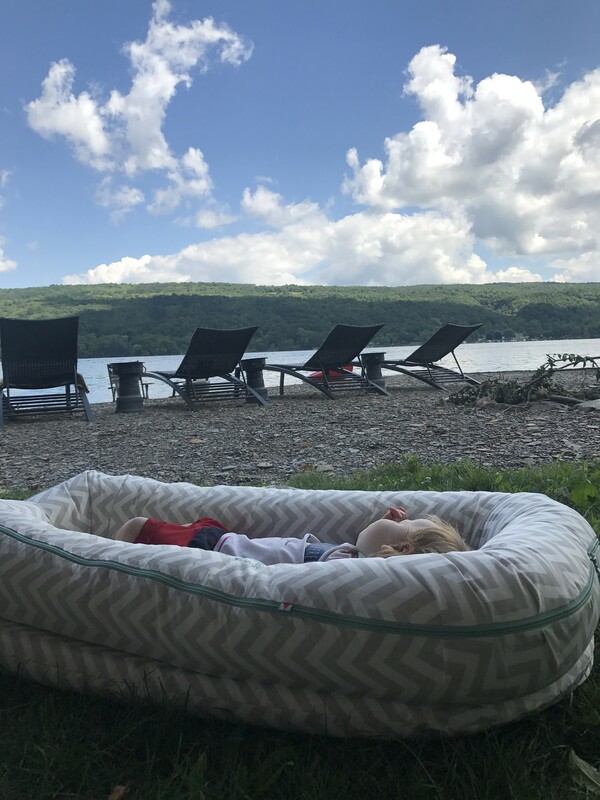 We used it for safer co-sleeping at night, a place to snuggle him up after baths, and a perfect mobile nap spot. 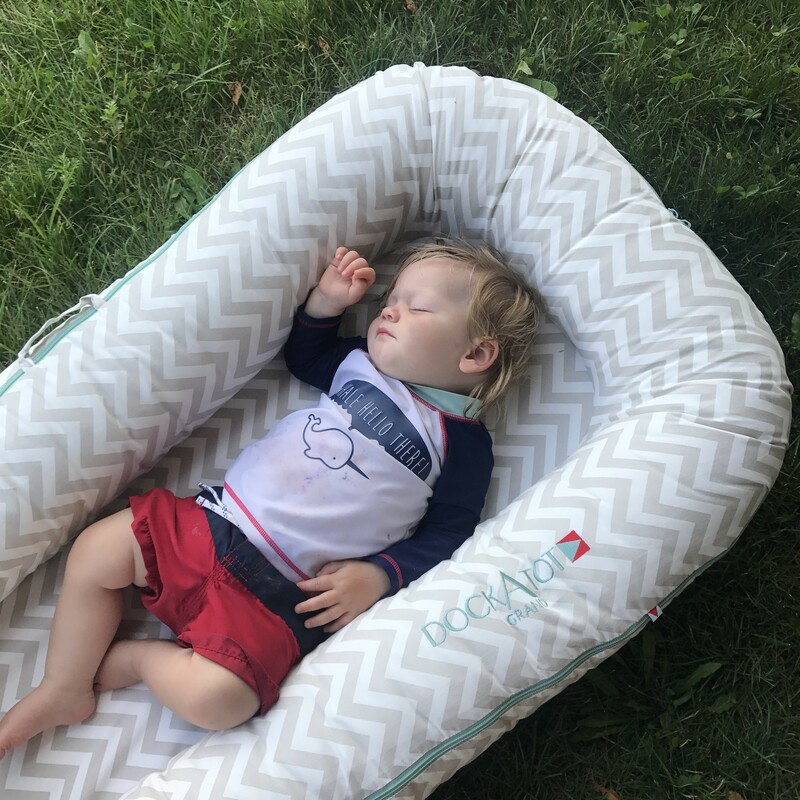 Now that Luca is older, we hadn’t used it for a while until I got the larger sized DockATot to try out for our summer travel. We had a crib where we were going, but were going to be spreading our time between my parents house, the lake house, the pool, day trips and other fun activities. I didn’t want to drag a pack and play everywhere we went and didn’t want to sacrifice his sleep either. 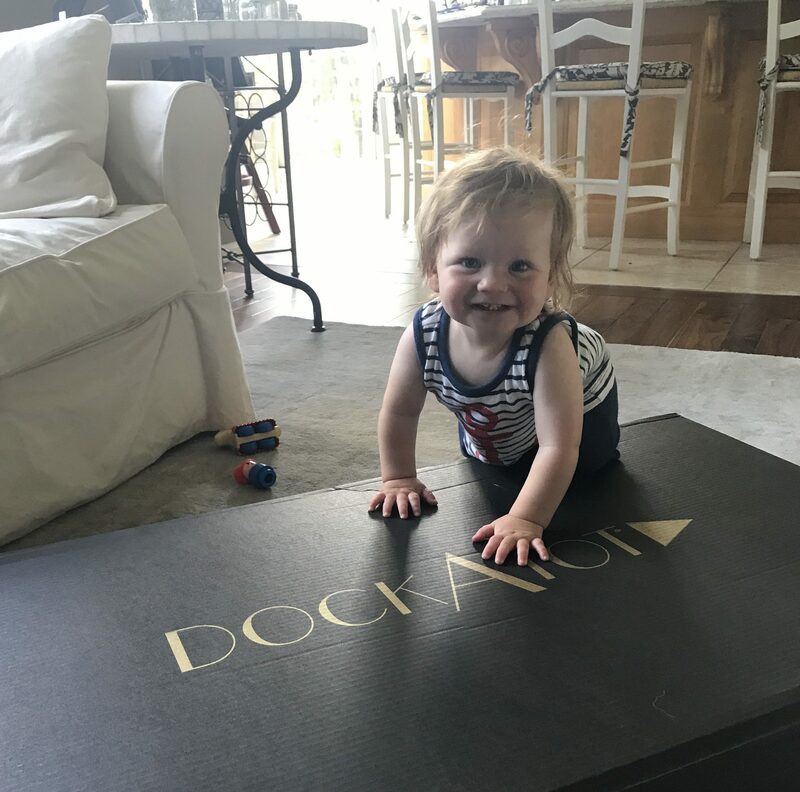 The DockATot seemed like the perfect option and I was not disappointed. The DockATot is not a magic baby whisperer, BUT it is a safe, mobile place for your little one to sleep. I honestly think because we got him used to sleeping in it when he was first born he now can easily sleep in it now. It’s WAY easier to tote around than a pack and play, and can be used as a super comfy lounger for the kids around the house. We have finally gotten naps figured out – and the key is – there is no “right” way to do it. On-the-go or in the crib doesn’t really matter, and as long as they get some daytime sleep, aren’t melting down like demons and seem generally happy and healthy – you are doing just fine. Don’t stress out about putting your little one down. 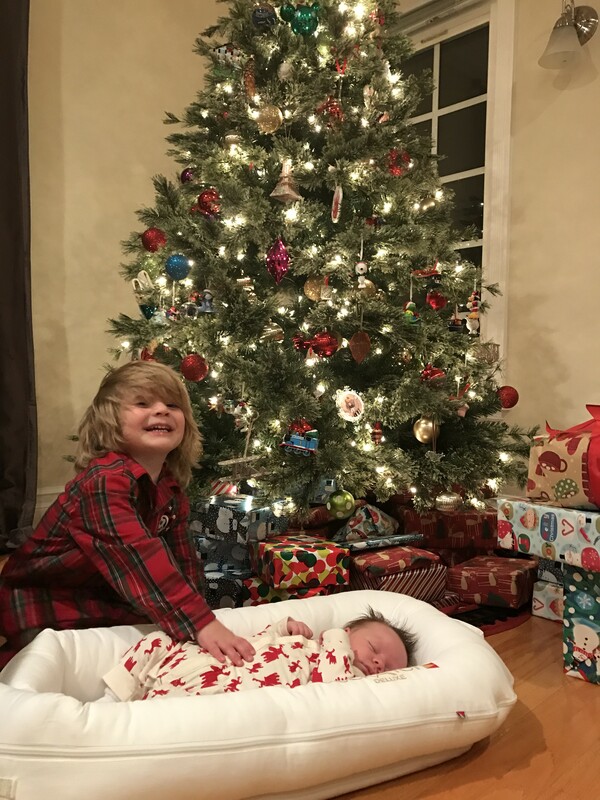 If you are spending more time and energy trying to get your little one to sleep than they are actually sleeping, maybe you should just pop em in the car/stroller/carrier and go somewhere – they will sleep if they need to. *Sponsored post. All thoughts and opinions are 100% my own.